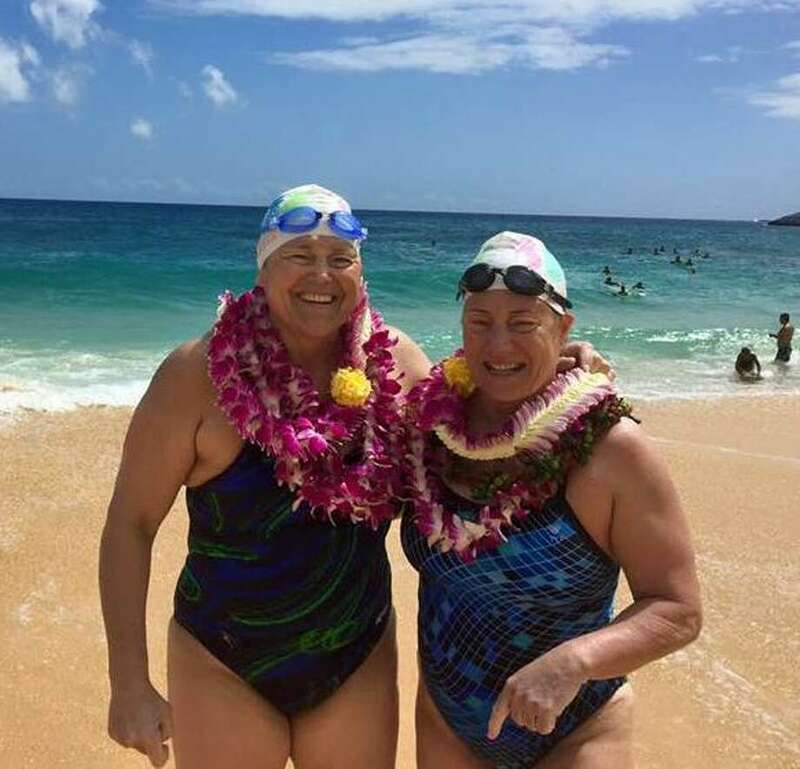 Westport's Elizabeth Fry (right) swam 17 hours and 30 minutes across the 42 kilometer Molokai Channel. Elizabeth Fry’s winter months are spent at the Westport YMCA, spending hours in the pool. As soon as the temperatures rise, Fry is in the water outside, whether it be at Compo Beach, the Long Island Sound or Lake Zoar in Southbury. This, combined with a busy career in finance and acting as the director of the annual SWIM Across the Sound fundraiser, Fry has a great deal on her plate. An unbridled work ethic has kept Fry strong in her late 50s. She was recognized for her efforts with another prestigious honor in a career full of them. As strong as ever in the water, Fry was one of 14 swimmers selected to be nominated for the World Open Water Swimming Woman of the Year award for 2016. It is the fourth time since 2009 she was nominated for the award, and though she didn’t win, Fry was pleased to be in the select company once again. In 2016 alone, Fry completed a trio of long-distance swims: A 30-mile crossing of Molokai Channel from Molokai to Oahu, Hawaii, a swim that took more than 17 hours. Next came a journey from Catalina Channel to Catalina Island in California, which took more than 12 hours. Fry also circumnavigated Anacapa Island in the Santa Barbara Channel. "It’s great to be recognized by the community," Fry said. "These swims were great, challenging swims; it was really just an honor to be recognized from all the swimmers out there. To be in the same group as a lot of those swimmers is nice enough." Fry cited the Hawaii swim as a highlight. It was the first time she had ever made the trip to the Aloha State. "I’ve never felt so small; it’s a vast ocean and you’re just out there," Fry said. "You’re never very protected out there and there’s marine life that has interest in you. The adrenaline a high because it’s a night swim, but finishes in the day; it’s a little scary." Fry — who was inducted in the International Marathon Swimming Hall of Fame in 2014 — has set numerous records and accomplished a plethora of feats throughout her open water career, which began later than most. Westport through and through, Fry — who moved back to town in the late 1980s — swam at Staples before going to UConn. A middle-distance swimmer in her youth, Fry’s first taste at the open water came in the Point to Point at Compo Beach. She was eventually exposed to longer distances — including a 10-mile swim around Candlewood Lake — and soon discovered that open water swimming was a competitive sport. A former marathon runner, Fry dove into the deep end and began participating in relays. One of Fry’s most proud moments came when she swam the English Channel for the first time in her mid-40s. Her father immigrated from the United Kingdom and was in attendance for her defining moment. After completing the epic swim across dangerous waters in the fastest time of anyone that year, Fry etched her name on a wall at the White Horse Inn, home of the oldest pub in Dover. "My dad was on the shore back on England; it was pretty amazing to be there with him," Fry said. "It was a pretty special time for myself, him and sister to share that experience." "The swim was just perfect," Fry added. "I had no idea how fast I was swimming or anything it was just perfect." She would later become the oldest female to cross the channel. Fry has also swam the length of the channel twice— a return trip. Like most swimmers, Fry has had several close calls with safety over the years. One swim across the English Channel ended prematurely when Fry, an asthmatic, had water infiltrate her lungs. She was pulled from the water by her captain, and though she suffered pneumonia as a result, made a recovery. "It was first time I appreciated that this is an extreme sport," Fry said. "I was swimming and suddenly I felt great, warm and moment of clarity (referring to a symptom of the attack). After being in the water for many hours; I knew that’s not how I should feel." Fry also had an encounter with another animal entirely, quite literally. While swimming off the shore of Connecticut near Stonington, she came 15-20 feet from a shark before being pulled from the water and into a two-person kayak. Jellyfish stings are also common with long distance swimming, which can get old after a while, Fry said. Life in the water has become transformational in more ways than one. "It’s a form of dynamic meditation," Fry said. "I get to meet extraordinary people who have done these swims, and have been to great cities in country. I’ve seen the world this way." When asked what she would like to accomplished in the future, Fry couldn’t limit her response to one or two swims. Canada, Mexico, Africa, New Zealand and Ireland all came up as ones on the bucket list. "I still have a way to go," Fry said.